PureOne Impressions: In My Dreams...Almost! 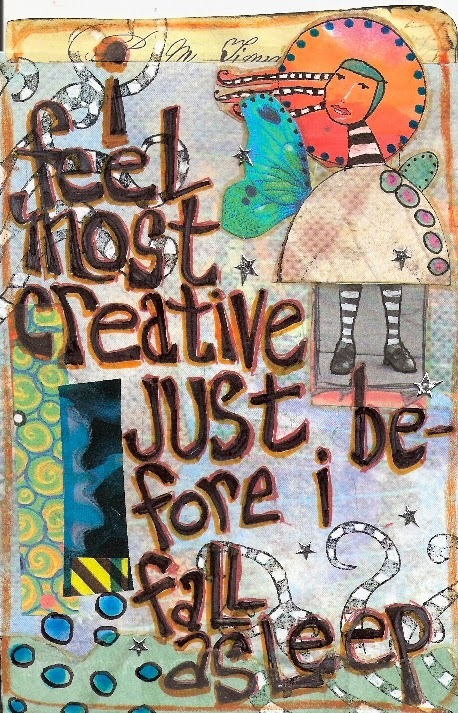 I am most creatively inspired...right before I fall asleep! Truly, my head rapidly fills with amazing images, and I think, oh I have to remember that so I can paint it. Well, of course, I don't remember them! The timing is horrible! And it makes me giggle. I mean, go figure! So I just had to create this page for my "It's All About Me," journal, the place where I record all those facts about me, such as "If I were a Color, I'd be Blue," and other such fascinating stuff! 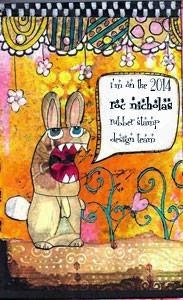 This mixed-media page features two rubber stamps designed by Roc Nicholas: Roc's Angel and Squiqqly Arms. Aren't they just dreamy? so much to look at - great page! the notebook by bed thing wouldn't work. i did think of that. but they're just colorful abstract images. and they change rapidly. You amaze me Ms Cathy. I have love everything you've put on your blog. God has totally blessed with an imagine!